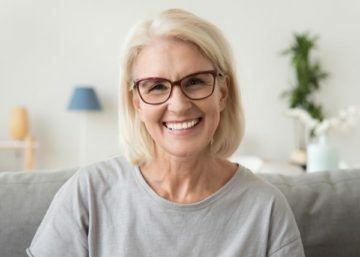 If you’re thinking about dentures as an option to replace a few teeth or an entire arch, congratulations! Dentures are an effective way to restore the look and function of a natural smile. However, there is an adjustment period in which you’ll need to spend some time getting used to the feeling of having them in your mouth. Our Grand Rapids, MI denture dentists are more than happy to answer any questions or concerns you have. 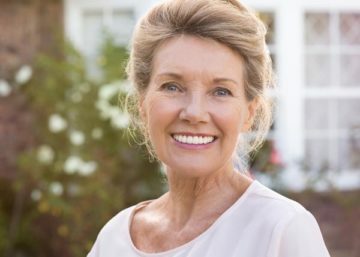 Here are a few things to keep in mind about the first 30 days with your new dentures. Like the name suggests, immediate dentures can be worn immediately after extracting teeth. If we need to extract teeth, our cosmetic dentists may prescribe you pain relievers and antibiotics to take as directed while the site heals. It’s important that you don’t remove your dentures during the first 24 hours so the gums have a chance to heal. Your full dentures act much like a bandaid during your first day, which is why you’ll even need to wear your dentures to bed. After the 24 hours, we highly recommend removing your dentures before going to sleep. That way, your gums have a chance to rest and stay healthy. Your gums were never designed to be covered by dentures 24/7, which is why you need to give them breaks. Since the extraction sites will be sore, we recommend eating soft foods like mashed potatoes or macaroni and cheese. Once 24 hours have passed since tooth extraction, you’ll need to return to our office so our dentists can remove your dentures. It’s normal to develop sore spots during the first few days of wearing dentures. You may also have more saliva. Gum tissue contracts as it heals. For this reason, you may need to visit our office several times so your full or partial dentures fit comfortably. If you experience dental discomfort or pain while eating, we recommend supplementing meals with Ensure or another protein-rich drink. It takes time for your gums, cheeks, and tongue to adjust to wearing an oral appliance. However, after a couple of weeks have passed, you’ll notice fewer sore spots in your mouth and less saliva. Don’t hesitate to call our office if you need your dentures adjusted. We’d be more than happy to set up a time for you to meet with one of our denture dentists in Grand Rapids, MI. It’ll take some time for you to get used to eating and talking with dentures. If you lisp while you talk, we recommend reading aloud from your favorite book and keeping a running list of words that give you difficulty. The more you speak with your dentures, the easier it’ll become over time. Take care of your denture teeth like you would natural teeth. For example, you’ll need to brush your dentures twice a day to remove plaque and prevent bad odor. Submerge your full or partial dentures in water or denture cleanser when you’re not wearing them so they don’t dry out. According to the Centers for Disease Control and Prevention, 47.2% of Americans age 30 and older have periodontal disease. Don’t be one of them. If you’re wearing full dentures, you won’t have any natural teeth left. However, it’s still important to keep your gums healthy by brushing them twice a day. Contemporary Family Dental is dedicated to helping you maintain a healthy smile with the help of full or partial dentures. To request an appointment with one of our denture dentists in Grand Rapids, MI, call (616) 209-3969. Am I a Candidate for the Dental Implant Procedure? Copyright © | Contemporary Family Dental | All Rights Reserved. Disclaimer: This website is provided for information and education purposes only. No doctor/patient relationship is established by your use of this website. No diagnosis or treatment is being provided. The information contained here should be used in consultation with a doctor of your choice. No guarantees or warranties are made regarding any of the information contained within this website. This website is not intended to offer specific medical, dental or surgical advice to anyone. Further, this website and Contemporary Family Dental take no responsibility for websites hyper-linked to or from this website and such hyperlinking does not imply any relationships or endorsements of the linked websites.